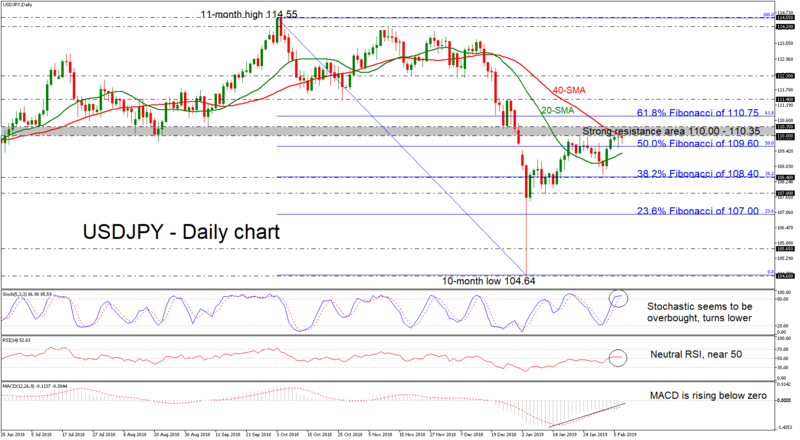 USDJPY has found a strong resistance obstacle around the 40-day simple moving average (SMA) over the last couple of days after the jump above the 50.0% Fibonacci retracement level of the downleg from the 11-month high of 114.55 and the 10-month low of 104.64, around 109.60. Currently, the pair is in a bullish correction mode following the rebound on the 104.64 support level on January 3, but the technical indicators seem to be in confusion. Looking at the momentum indicators, the stochastic oscillator is turning lower and is in progress to post a bearish crossover within the %K and %D lines, while the RSI indicator is flattening near the neutral threshold of 50. However, the MACD oscillator is rising in the negative territory around the zero line. According to the SMAs, the 20-SMA is moving higher, approaching the 40-SMA for a bullish crossover in the near term. The price is currently knocking on the door for the 110.00 handle and if there is a successful attempt above this barrier it would open the door for the 110.35 resistance level. More advances could turn the focus on the 61.8% Fibonacci mark of 110.75, before extending bullish pressures until the next resistance of 111.40. A reversal to the downside below the 50.0% Fibonacci and the 20-day SMA could find support at the 38.2% Fibonacci region, which overlaps with the 108.40 hurdle. If the latter fails to halt bearish movements, the next target could be at the 107.80 low, identified by the bottom on January 10. Turning to the long-term picture, the outlook is neutral over the past year and only a decisive close above 114.55 could resume the bullish picture. On the other hand, a significant decline below January’s trough of 108.10 could shift the outlook to bearish.